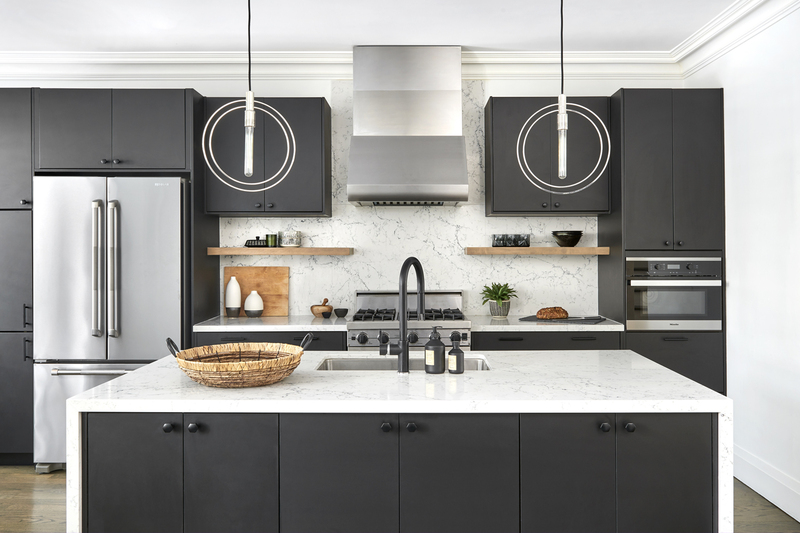 B lack Sheep Interior Design is a boutique firm based out of Toronto, with projects across the GTA, cottage country, and the Caribbean. 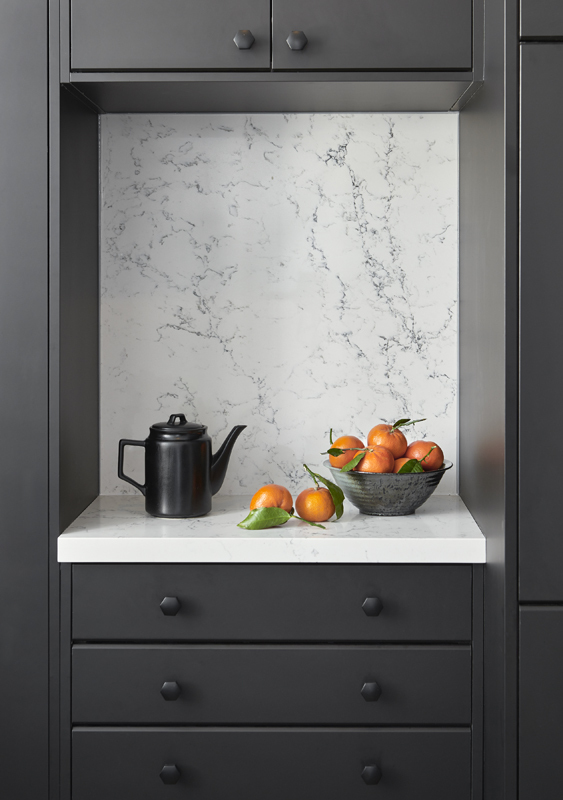 Founded by Principal Maia Roffey in 2013, Black Sheep caters to clientele looking for bespoke design tailored to suit their taste and lifestyle. This property in Toronto’s Beaches neighbourhood was no exception. The clients approached Maia and her team to help them update a house with good bones, but gravely dated finishes. 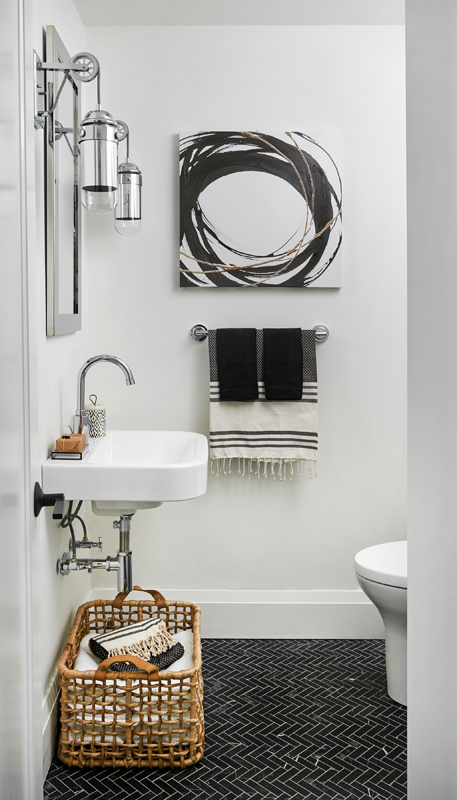 They wanted to achieve a sophisticated modern style, without sacrificing the warmth of a family home. Prior to renovation, the entire house was dominated by golden yellow wood on floors, stairs, newel posts, and handrails. Maia stripped the floors and re-stained them in a muted greige, setting the tone for the project’s monochromatic palette. The spindly posts and handrails were replaced by squared modern options also stained to match the floors, and ornate pickets were swapped for streamlined alternatives. 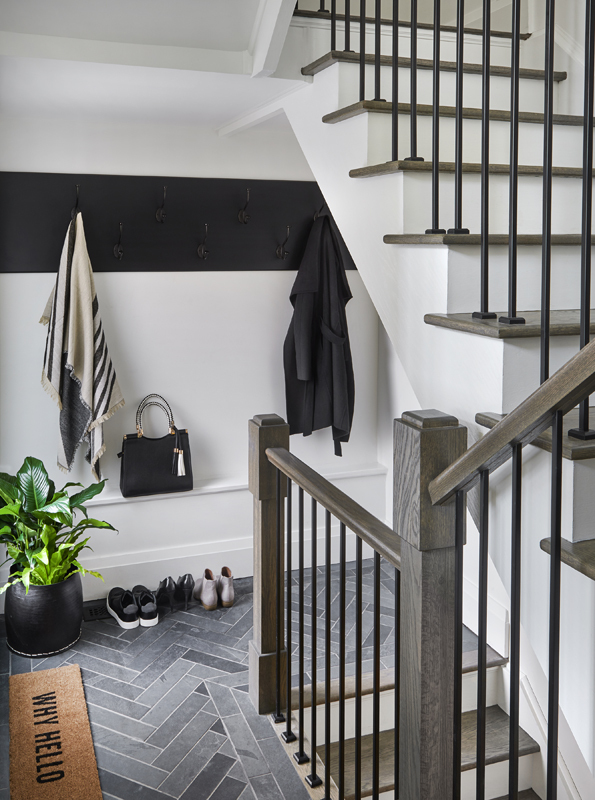 In the foyer, the dated granite flooring was removed to make way for a natural slate laid in a herringbone pattern. 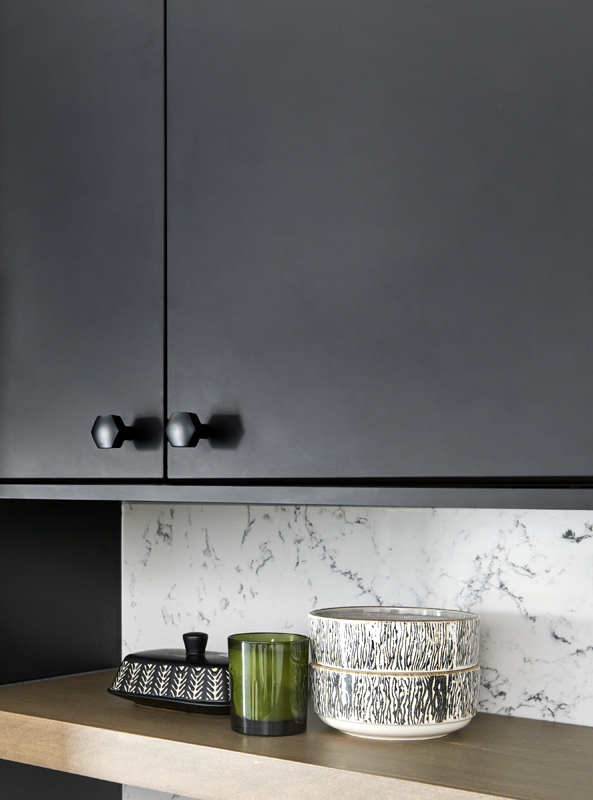 To accommodate this busy family’s needs, a custom millwork panel with over-scaled black coat hooks was added to provide additional storage at the entry. 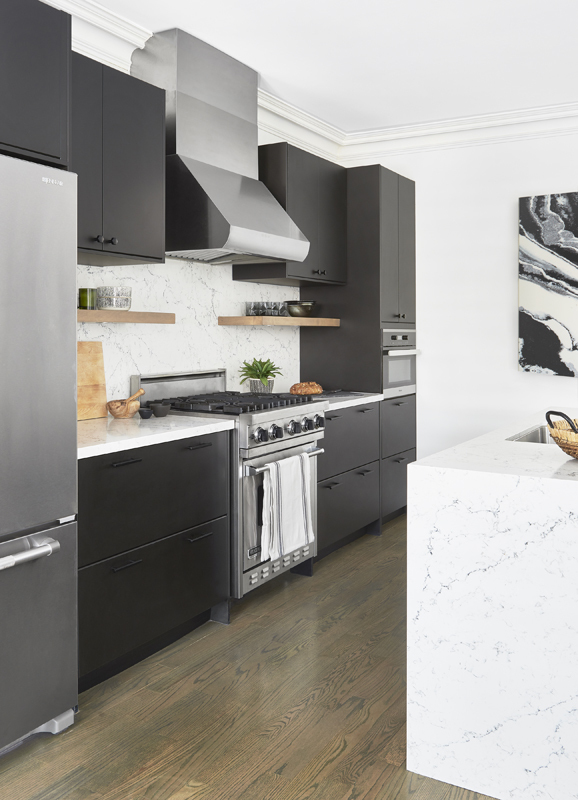 In the kitchen, Black Sheep streamlined the layout, opting for one full wall of cabinetry, which incorporates appliances and ample counter space. The island was rescaled to suit entertaining and to maximize storage. Floating wood shelves were custom made with integrated lighting and stained to match the floor below. These provide an opportunity for display and tie the kitchen’s detailing to the rest of the house. 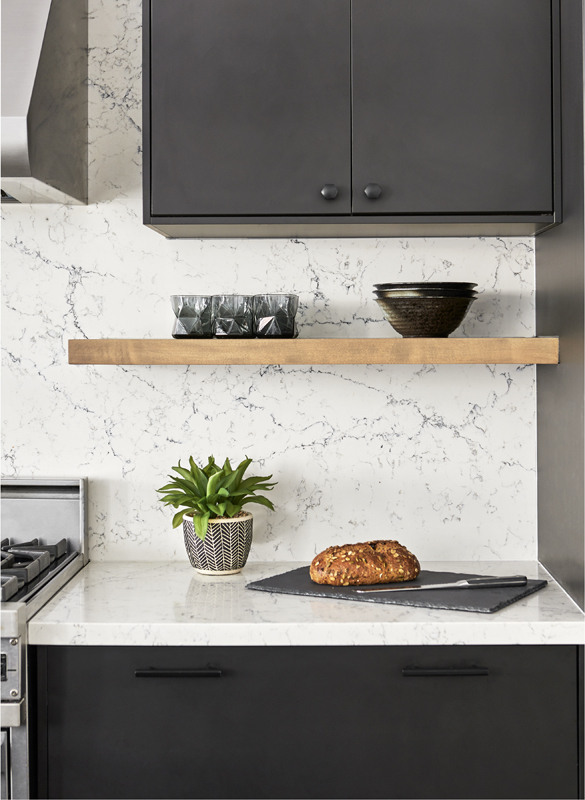 Maia brought drama to the room by using a boldly-veined quartz countertop, which not only waterfalls down both ends of the island, but also up the backsplash. 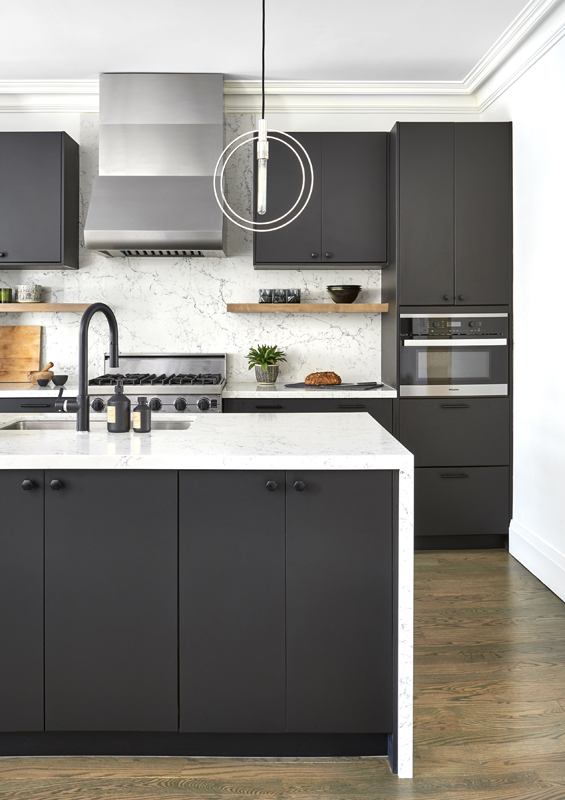 The matte black cabinets with matching hardware and faucet add to the impact of the space. For a final touch, she hung unique open pendants over the island to provide a counterpoint of delicacy against this strong backdrop. Maia convinced her clients to gut the powder room and front hall closet. These had been poorly laid out, inefficiently eating up floor space and leaving an awkward plan for the bathroom. By reworking the dividing walls and incorporating an alcove in the hallway, Maia increased the usable square footage without impacting on the rest of the main floor. 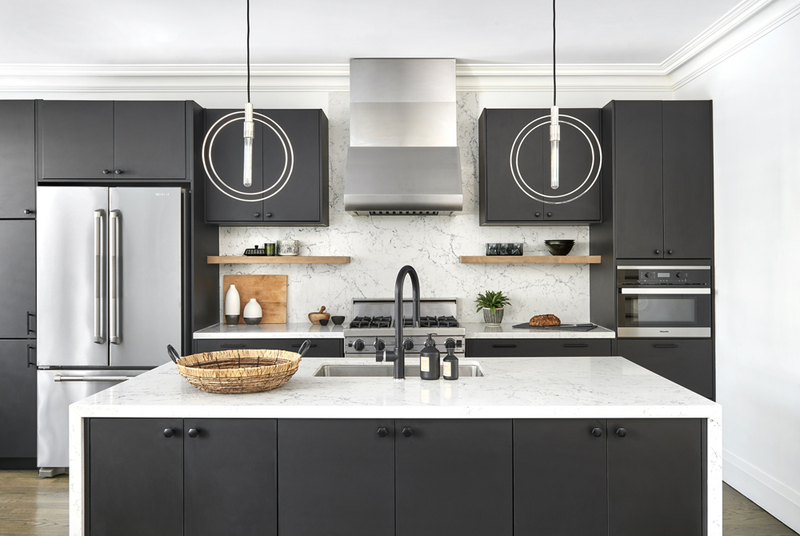 Continuing the bold colour scheme of the nearby kitchen, she used a custom-cut black marble mosaic on the floor for visual impact, while choosing a floating sink to open the space even further. 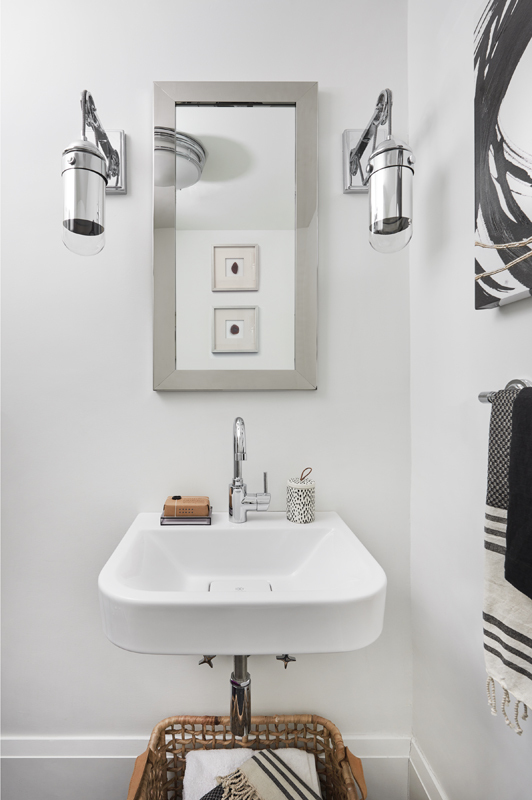 Polished nickel finishes on the plumbing and industrial sconces serve to further elevate the look. The vaulted space of the great room is open to a substantial landing on the second floor, which was largely unused. Here, Black Sheep replaced the railing and pickets with a halfhigh wall topped by a custom black rail, creating much-needed office space. 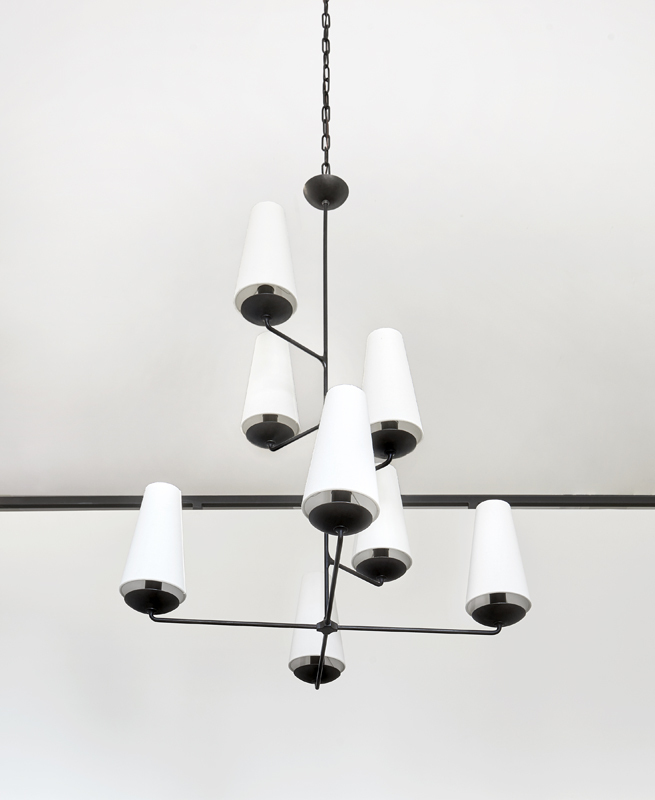 Replacing an old ceiling fan with a modern chandelier required the use of scaffolding, but was well worth the effort. This double-height space, which previously felt empty, is now an attractive feature of the house that is visible from both floors. 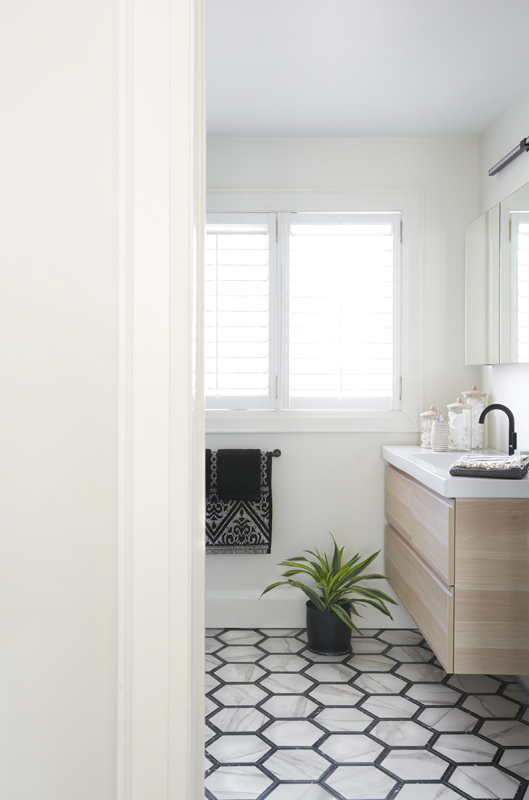 On the third floor, a creamy and dated ensuite was completely overhauled. 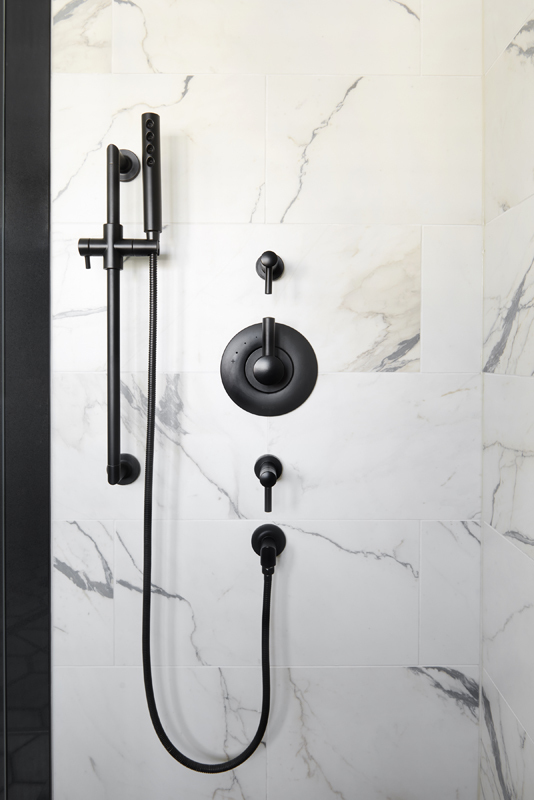 The sophisticated black and white scheme in the new master bath creates a polished oasis. 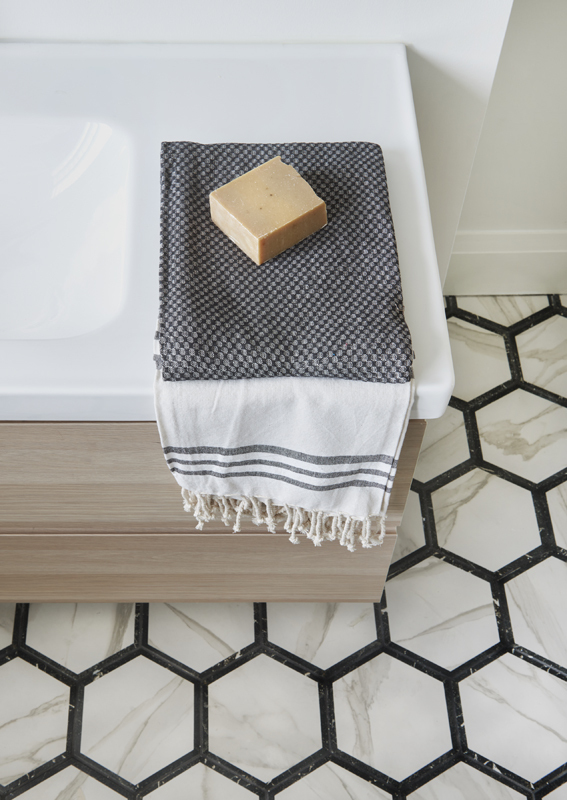 Maia selected a combination of three porcelain tiles, featuring a mix of hexagons and faux-calacatta colouring. 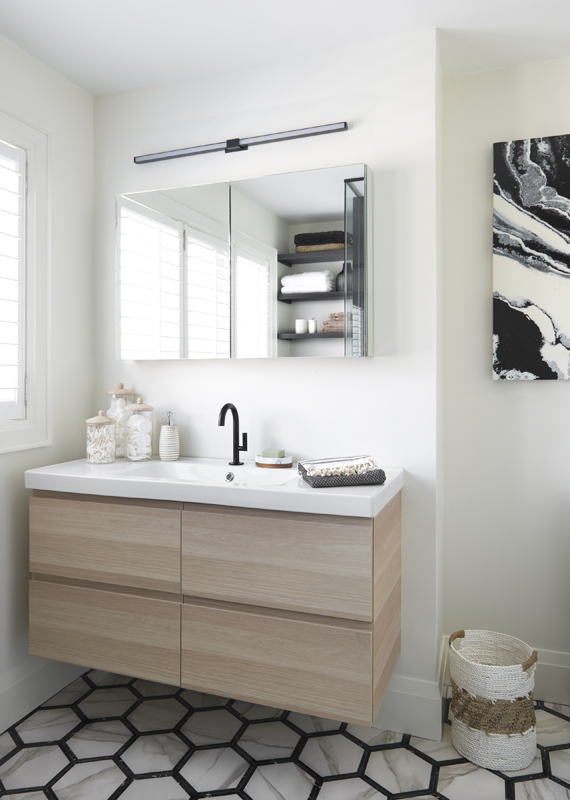 The neutral tones of the tiles’ veining are echoed in the blond wood vanity and curated accessories. No detail was overlooked in putting this space together. 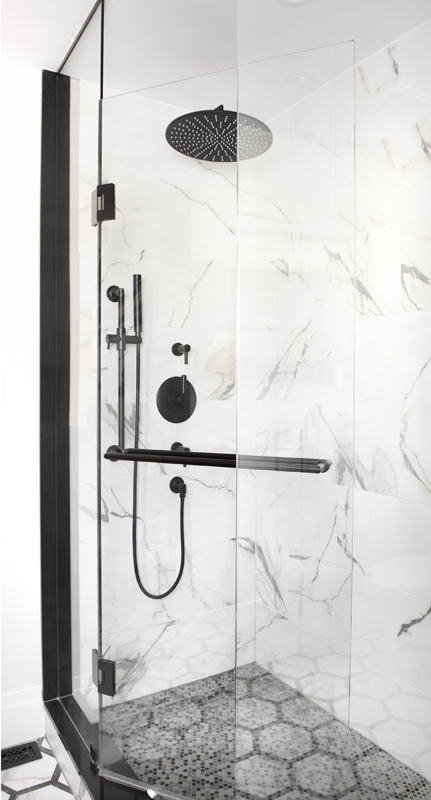 Elegant hits of matte black are found throughout; from the lighting, to the plumbing, and even to the hinges on the shower door. The Black Sheep team worked substantial changes on all three floors of this home. 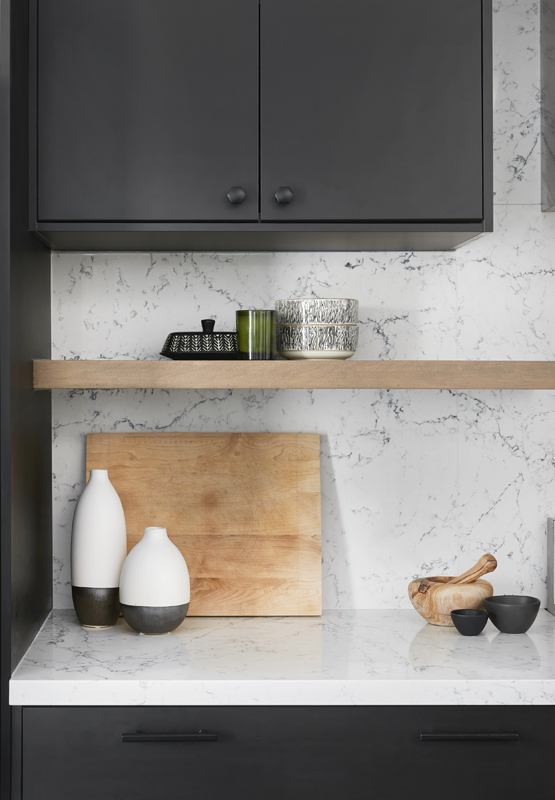 The finished product is a testament to that fact that a minimal colour scheme, when carefully implemented, can create a space that is anything but cold or boring.